Thanks for all the responses! I was quite pleasantly surprised to see how quickly everyone (pretty much) either hit on the right translations, or hovered right around them. Now I’ll go through them and make some comments. First, big ups to ingsve, who responded with almost perfect translations only 26 minutes after the post went live. Nice job! The unofficial tagline of Game of Thrones, and probably the most famous house motto of them all. Those who follow my Twitter will note that I tweeted this translation way back on December 14th of last year (or at least I think it was last year. They don’t seem to list a year on tweets…). I think ingsve took note of this on the Dothraki Wiki, and he also got the exact translation: Aheshke jada. Qvaak added an interesting take on it with Aheshke zin jada, which he translated appropriately as, “Winter is still coming”. Personally, I like to think of zin as the counterpart to ray. It can mean “still”, but it also emphasizes that an action is being viewed internally as incomplete. I think Aheshke jada is the more appropriate translation, but you could say Aheshke zin jada, if you were, say, looking at winter, and it was charging right at you. I knew, of course, that ingsve had taken House Greyjoy’s sigil as his personal icon, but I had completely forgotten that I had already pretty much translated House Greyjoy’s motto for him (or at least created the words, and I think ingsve did the rest). So ingsve’s Kisha vo velaineroki is correct. Daenerys came up with the same translation, which is also correct. Nice job! After that, both Laura and Qvaak came up with an interesting variant using a postpositive negative particle. Qvaak’s is based on a well-observed pattern: Kisha velaineroki vosecchi. I like it! It’s rather emphatic. Laura’s translation used vos postpositively, which is something I haven’t done myself before, but I really like it. After all, if you can have vosecchi, it seems like you ought to be able to have vos. So, for example, the usual negation pattern would be the ordinary version; using vos postpositively would be emphatic; vosecchi would be really emphatic; and the double negation (which is also possible) would be really emphatic (i.e. Kisha vo velaineroki vosecchi!). Actually, the translation I was thinking of was simply: Hajolat. When I see “Growing Strong”, in English, I think of it as a self-contained, nominal concept. To me, hajolat seemed like the most obvious translation. But this is why it’s so interesting to see other translations: You get different interpretations. Update: Oh, you know what? There’s one more I forgot to list: Athhajozar. That also seems to work. This one was probably fairly straightforward. Laura, ingsve and Daenerys came up with the same translation: Kisha kovaraki jinne. That’s pretty much, “We stand here”. I wanted to quote this because I have to say I think exactly the same thing! I don’t know if I would’ve put it into those words beforehand, but when I read it, I thought, “Hey, yeah! That’s exactly how it feels!” Nice observation! I thought this one would be the simplest, since, as ingsve, Daenerys and Laura did, you could just translate it word for word: Rhojosor, atthar, chomokh. There’s nothing wrong with that translation. The words in English are separated from usual English syntax (after all, you’d expect an “and” in there, too, if it were a part of a sentence), so it stands to reason that they might fall outside the usual syntax in Dothraki as well. Qvaak elected to insert the “and”, giving us: Rhojosor ma atthar ma chomokh. However in order to do this properly, it would need to be Ma rhojosor ma atthar ma chomokh (it wouldn’t work without an initial ma—in fact, it might sound like “Family is duty and honor” without it). The first is ingsve’s Charas m’anha zorak! (as Qvaak pointed out, it’d be m’anha not meanha). Daenerys also offered a version similar to this. The literal translation would be, “Hear that I roar”, which is close. To me, it puts a little bit of distance between the hearing and the roarer—kind of like, “Take note of the fact that I’m roaring”, rather than, “Listen to me, and note that I’m roaring”. Qvaak’s translation fixes the above: Charas anna fin zora! The odd thing about it is the relative clause attached to the first person pronoun. I mean, you can do that, but is it just me, or does that sound a little funny? Think about this one in English: “Talk to me, who is/am from California.” Should that be “is” or “am”? And why do both sound wrong? Weird! The translation does work, though. Believe it or not, Laura’s translation was exactly what I was thinking of. It is literal, but it works: Chari anna zorat! Note that she used the formal imperative, which seems appropriate for a house motto. Anyway, this structure is grammatical, as it is in English. It’s probably not how you’d always do it, but it serves for this. Actually, I rather expected someone would come up with my other preferred translation: Chari athzorar anni! or “Hear my roar(ing)!” It’s not an exact translation, but I think it serves—and it neatly avoids subordination. Great translations! This translation showcases a feature of Dothraki which is different from English except in this very construction, in which it’s identical. Both ingsve and Laura got the translation: Ven yath ven chomokh. In Dothraki, both ven’s are obligatory, unlike in English (i.e. “High as honor” also works). Not only that, but all coordinators double in Dothraki in most situations (as we saw above with ma). There are some that can occur by themselves, but only in very specific grammatical contexts. For usual situations, coordinators appear before both elements being coordinated. Qvaak mentioned that he thought it was strange to compare two words from different classes, but, in fact, that happens all the time and is perfectly normal in Dothraki with ven. So, that’s it! Thanks to those who participated. You all did great! Also, props to Laura for attempting a translation of “Say your right words!” I’d offer my own translation, but I can’t quite figure out how it works in English… Maybe Asti as jili yeri…? It’s quite a quaint version of English, though, so I’m not sure if the quaintness would translate correctly. And for those who haven’t figured out the bonus still (even with today’s title and the picture shown below), the title from our last post referred to one of my all time favorite movies: Labyrinth! Oh, and, by the way, in the movie, David Bowie’s character performs some contact juggling using see-through “crystals” (plastic or glass spheres). The title from the last post is the word “fire” from the blog magnified through my own glass sphere which I bought in order to master contact juggling just like the goblin king many years back. I, uh…never got too far with it. Posted on October 19, 2011, in Community, Vocabulary and tagged responses, translation. Bookmark the permalink. 28 Comments. I’m absolutely thrilled I didn’t get everything wrong! I don’t recall reading anything on Twitter, but I’ve only been there a couple weeks. I’ll be paying more attention now, maybe next time I’ll get a few more right. If only I had known you were a Bowie fan too! If only I had known you were a HUGE Bowie fan too! Yes, I remembered that tweet when I saw the word aheshke. I had that phrase in an old list of unknown words that had fallen into oblivion for a while so I’m glad that can now be struck from that list. lol That does seem like the most appropriate translation (though I might add to the end, “All y’all be TRIPPIN’!”). Oh, and David… When you say, ‘Believe it or not, Laura’s translation was exactly what I was thinking of’, you mean it as ‘I can’t believe someone thought exactly what I was thinking’, or ‘can you believe it, that dumb person thought exactly what I was thinking’? No, no! The fact that you are offered the translation was incidental. What was a bit unbelievable is that the translation is pretty much literal—and word for word. That happens quite rarely. You did an awesome job! I did a huge fail on adding “et” in my attempt to translate “As High as Honor”. I was following the sentence of “Anha adothrak hrazef ido yomme Havazzhifi Kazga ven et vo khal avvos”. Wow! Two huge Bowie fans, besides me! Besides having his whole discography, and yeah, I got to see him twice in concert. Once when he performed with NIN and then for the Earthling tour. 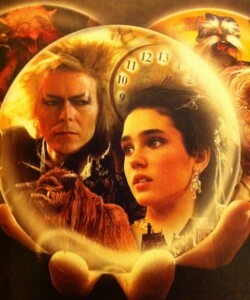 I love “Labyrinth”, but in that particular instance, although I like muppets, the Goblin King needed more airtime. Cheers for “The Hunger” too and “The Man Who Fell to Earth”! I have the Criterion Collection version of _The Man Who Fell to Earth_. Still can’t believe he wasn’t able to do any music in it, though! And I’ve never seen David Bowie in concert. So, would it be correct to say, ‘Bowie athdavrazar’? He is awsome. Had the opportunity to see him in concert twice, and I will cherish and treasure those moments forever. And have watched many on DVD as well. Serious Moonlight is one of my all time faves. No, strike that. Every and anything David Bowie, those are my all time faves. Daenerys, YES!!! The Hunger, amazing. True story: I have Serious Moonlight on VHS. I think if you wanted to say “David Bowie is good”, it’d be Bowie davrae; “excellent” would be Bowie vezhvena. And I’ve never seen The Hunger. Not a horror person, but that one sounds like I could bear it. Read the description online; want to see it. Netflix to the rescue! Yes, Serious Moonlight is too awsome for words. Have DVD, on the iPod, CD. so Bowie vezhvena it is. As to The Hunger, watch it, please! It’s really good! Susan Sarandon, Catherine Deneuve. And try to spot Willem Dafoe. Let me know afterwards. ps: when is the next excercise in dothraki? Would you consider the use of vos where vo can be applied already slightly emphatic: that Kisha vos velaineroki. could already be viewed as bit more amphatic than Kisha vo velaineroki., and still less emphatic than Kisha velaineroki vos? Would it be ma shekh ma shieraki anni if the phrase would not be so idiomatic already? I would have been more surprised, if Chari anna zorak! had been grammatical. Chari anna zorat! has an intuitive rightness in it (though my sense of the formal imperative has been a bit off). But how would you describe the syntactic role of zorat? If you would expand “as high as honor” to full sentence, eg. “We are as high as honor,” would it still go the English way or would it be something like Ven kisha yathaki ven chomokh? Oh, I missed that Vorsa ma Qoy also clearly lacks the leading ma. So while two words need only one ma (but two would be OK, I guess), three need three! ..Or would one work there too? Yeah, so here’s the thing with that. It is different because there are only two items and because they’re being used in isolation. Oh I also seem to have missed your first comment entirely… I don’t remember reading it; I’ll have to go back. Anyway, if instead of just referring to “fire and blood” in isolation you were to say “I need fire and blood”, you’d say Anha zigerek ma vorsasoon ma qoyoon. (I feel like I’ve written this before… Just déjà vu?) It’s just in isolation that you can use the one to coordinate the two phrases; three is too many. Would you consider the use of vos where vo can be applied already slightly emphatic: that Kisha vos velaineroki. Yes, if it’s emphasized. It’s probably going down the road. No, because of anni. That would be “the sun and my stars”. But how would you describe the syntactic role of zorat? That’s a place where you see ven used singly. Does that mean I can say: “Chocolate davrae vosma Bowie vezhvena”? Hmmm… Or maybe there are different words for objects versus people or animals? David, I hope Bowie tours again so you can see him perform. Laura, what concerts did you get to see? David, I agree with Laura. Definitely, watch “The Hunger”. And Halloween coming up, it’s the perfect time. I am not musch of a horror fan either. The movie is based on a Whitley Streiber novel, not that I’ve read it. There is music, which is beautiful, but it is mostly classical. The band Bauhaus, which if you are a Bowie fan, you should like too, makes a cameo in the opening sequence with the song “Bela Lugosi is Dead”. They do have an incredible cover of “Ziggy Stardust”, but not in the film. Peter Murphy, who was the front man for the band, recently played locally! “Ziggy Stardust and the Spiders from Mars: The Motion Picture” video is very good too. And you both may really enjoy “The Best of Bowie” DVD which has 47 videos. Does that mean I can say: “Chocolate davrae vosma Bowie vezhvena”? Yes, that is how you’d say that. Man. To live the rest of my life without chocolate or David Bowie… That’d be a tough choice. Seeing that sentence made me think: chokolat (or chokkolat) could be an infinitive verb in Dothraki, no? Maybe you should add that to the vocabulary. I’m sure you can come up with an appropriate meaning. Daenerys, I saw Sound + Vision (awesome, awesome, awesome) and Earthling. Will definitely get the “The Best of Bowie” DVD, thanks! Matt, definitely has a Dothraki look/feel to it! I’m not sure if this was covered elsewhere, but how do you say “Ours is the Fury” for House Baratheon? Kind of late in responding to this, but for historical purposes, I replied to Crown of Gold’s comment with a blog post which you can read here. R U GOING TO LOJ THIS WEEKEND? I am not. In fact, I’d never heard of it until recently (for those curious, we’re talking about Labyrinth of Jareth). I was actually kind of disappointed to learn it didn’t have more to do with Labyrinth (which is, of course, the best movie in the world). I don’t costume much myself (in fact, I feel awkward even wearing a hat—any kind of hat), so I don’t think it’d be my kind of thing. If you go, though, let me know how it is!